This is a guest post by Darren Rippy. Darren is a graduate student in the Master of Public Policy program at the College of William & Mary. He is a summer policy fellow at the Virginia Interfaith Center for Public Policy. Corey Stewart, the Chairman of the Prince William County Board of Supervisors, has been making news headlines over the past couple of months. Mr. Stewart became prominent in the national media particularly after Arizona signed the notorious immigration bill SB1070 into law. This is because Mr. Stewart is very outspoken in his desire for Virginia to follow in Arizona’s footsteps and pass nearly identical immigration legislation in the Commonwealth. Quotations marks are around “the rule of law” because I wonder what law(s) Mr. Stewart seeks to uphold? The growing consensus is that the current laws that make up our current immigration system are ineffective in promoting legal immigration into the United States. This is especially the case for unskilled immigrants who have no family relations in the US. But even as fear of immigration grew, legal restrictions against the entry of Europeans were minimal, even for the poor. Ellis Island immigrants were so successful at adhering to U.S. immigration law largely because it barely existed. Of the 12 million immigrants who passed through Ellis Island, only 2 percent were denied entry to the United States. Upon arrival, the vast majority of immigrants — most of them poor and uneducated — spent several hours at Ellis Island before they were legally admitted to America. The legality threshold for 19th- and 18th-century European immigrants is incomparable to the gauntlet of restrictions facing contemporary immigrants. The immigration bureaucracy has increased so that today’s immigrants—perhaps more educated and skilled than Europeans arriving a century ago—face unprecedented barriers. It can take years for a immigrant with family already in the United States to gain legal entry. Mr. Wainer specifically demonstrates how laws concerning immigration have radically changed since our country’s beginnings. Often, these changes were a result of the exaggerated perception that the United States was subject to an “invasion” of immigrants of undesirable ethnicity and/or religion. 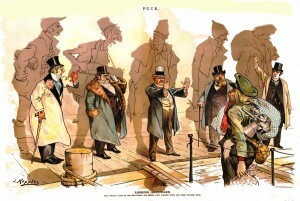 As is common today, nativists during each previous episode of large flows of immigrants were inclined to blame these newcomers for causing an array of social ills. The result is that our immigration laws have become increasingly restrictive. So, the question remains: Is it really worth passing an (immoral) law in Virginia that will further human suffering for the sole purpose of upholding a set of laws that are not properly functioning? Yes, America is a country of laws. However, the purpose of these laws is to protect freedom, promote civil rights and equal treatment under the law, and to ensure that justice reigns throughout the land. When a set of laws fail to achieve these ideals, they must be challenged and changed. To uphold laws simply because they exist is short-sighted and can lead to unnecessary suffering or injustice. In this spirit, I hope Virginians can see through the appeal to uphold “the rule of law,” oppose The Virginia Rule of Law Act, and continue to urge their elected officials to seek a comprehensive, and just, solution to the challenges facing our very broken immigration system. Our political leaders love to tout our freedom loving nation that was forged through the cooperation and participation of immigrants. Indeed, most of the transcontinental railroad (an almost impossible achievment at the time) was built by Chinese immigrants in the West and Irish in the East. Yet, many today disregard contributions made by immigrants and prefer to point to the “evils” brought by immigration. Hypocrisy at its best. I am all for the rule of law but not when that law is flawed and ineffective as was the reasoning of our founding fathers. Our immigration laws are outdated and inefficient if not as you say immoral. Our amnesty laws in reality provide relief from persecution to very few. As an ambassador and representative nation of freedom and democracy, we need to take a long look at our attitude towards people who only desire the same freedom and opportunity that we enjoy. Well said, Darren and Liz. Immigrants have been central to the US’ success over time as they brought with them new ideas, new ways to look at things, eagerness to work and improve things in a land where such improvements and accomplishments were feasible, unlike where they came from. These same assets are still present in many of today’s legal and illegal immigrants. Furthermore, when 12 million immigrants passed through Ellis Island to become citizens, this country was just beginning to industrialize. The more people coming through, the more able bodied workers this country gained. The need for cheap labor was overwhelming. Today, we are a developed and industrialized nation that has a 10% unemployment rate. That’s not to say that immigrants aren’t valuable, but it does show how much our economy has changed. Immigrants do bring an immeasurable amount of valuable skills and knowledge to the U.S. It is a shame that our immigration system is so convoluted; this is the problem that needs to be addressed. Simply allowing people to continually live illegally is a travesty. I certainly am not allowed to break the law everyday and still stand free. You are attacking the wrong issue.